A wall where visitors to the Franklin Cares location shared their dreams. Photo by Jennifer Jean Miller. 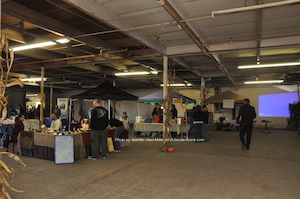 FRANKLIN BOROUGH, NJ – Residents and friends of Franklin visited the former Morley Shirt Factory on Saturday, October 25, to celebrate the first annual Franklin-Fest and Open House. The historic location is now home to the Skylands Medical Group and other health services providers. Eventually, the location will become a destination to provide traditional and alternative wellness options to the community. Click here to read the previous article in NJ Inside Scene about the effort. 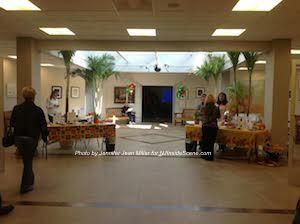 Skylands Medical Group offered information and health screenings. Photo by Jennifer Jean Miller. Attendees enjoying the event. Photo by Jennifer Jean Miller. Vendors and non-profit groups with information and items for sale. Photo by Jennifer Jean Miller. Dr. Jean-Paul Bonnet, the co-founder and former CEO of Skylands Medical Group has spearheaded the effort, to create a venue where non-profit groups can serve the community under one roof. Bonnet is also the founder of SantéBus, and the Skylands Outreach Depot, two non-profit groups. SantéBus has assisted the medical industry as a provider of supplies to Haiti, and Skylands Outreach Depot collects medical supplies and mobilizes disaster relief buckets to assist in disastrous situations. The Bodhi Tree Café, previously on Munsonhurst Road, is in the process of reopening at the location and as part of the Franklin Cares initiative. 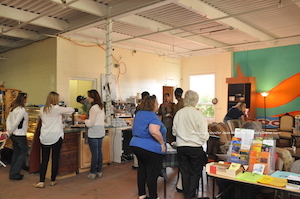 Yesterday, the Bodhi Tree offered food and coffee for attendees to enjoy. 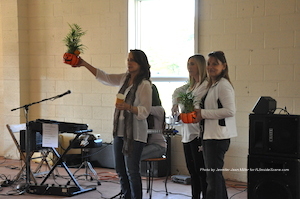 The event was a fundraising activity for the Bodhi Tree. 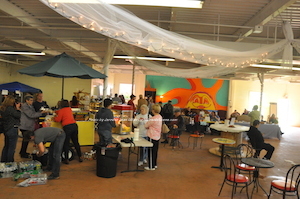 Coffee and food at the planned site of the Bodhi Tree Cafe. Photo by Jennifer Jean Miller. A giveaway during the event. Photo by Jennifer Jean Miller. The activities included: live music (Regina Goldy, Rosie Lazroe, Kyle Constantine, Jeff Gaynor/Mike LoMauro, Mike Lawlor and R.E.N.O. were part of the lineup), games, pumpkin painting, caramel apple making, face painting, henna tattoos, fall portraits, health checks, vendors, an antique car show, giveaways, and more. 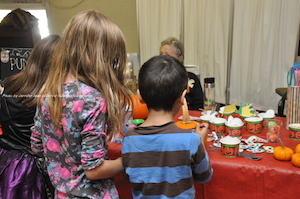 Children painting pumpkins. Photo by Jennifer Jean Miller. 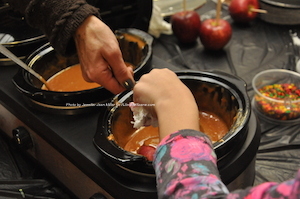 A volunteer helps one of the children dip an apple in caramel and sprinkles. Photo by Jennifer Jean Miller. Some of the non-profit groups in attendance were: the Sussex County Veterans Group, Sunrise House, Habitat for Humanity, Franklin Cares, Skylands Outreach Depot, SantéBus and the Stockholm United Methodist Church. Franklin Mayor Paul Crowley was one of the guests in attendance. He said he was happy to see the many groups, including the veterans group, at the event, and is supportive of the beneficial work that the Franklin Cares initiative is spearheading. Eddy Miller entertained children and parents alike with his EaZy Bubbles, and massive bubble nets. 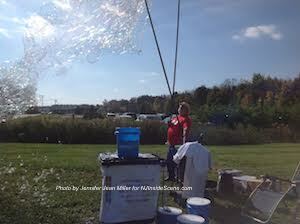 Miller, who is a frequent attendee at a variety of events said, “Bubbles have no boundaries.” Photo by Jennifer Jean Miller. 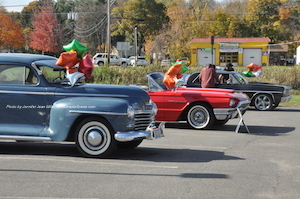 Vintage cars sparkle in the fall sunshine and are lined up during the car show. Photo by Jennifer Jean Miller. “We’re happy to see how successful they are, and we’re encouraging them,” Crowley said. Other plans for the Franklin Cares initiative at the former Morley Shirt Factory location include: low-cost medical care where those in need pay what they are able, a hydroponic garden center, and an eatery concept similar to Jon Bon Jovi’s Soul Kitchen, where diners pay a minimum donation or volunteer their time to earn a dining certificate. The location of the former Morley Shirt Factory where the Franklin Cares initiative is growing, is accessible from Mitchell Avenue. Click here for the Franklin Cares Facebook Page.